Our Pet Barrier Electric Dog Fence Kit for Big Dogs is a safe dog containment solution that is suitable for large breed of dogs from 12kgs and up ( Click here to know which breeds it is best for ). These Electric Dog Fences are designed to stop big dogs from escaping, jumping the fence and from digging up holes in your garden. 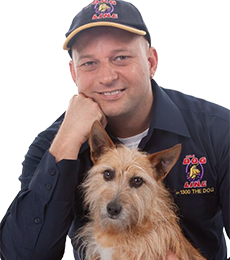 Would you like to know more about Dog Fences First? Download your FREE Buying Guide and Chat to our Consultant. The dog fence collars are an important part of the kit because the collar trains the dog to stay away from the boundaries that you created. There's a safe level of stimulation that you can adjust until the dog fully understands the consequences of trying to get near the boundary. Upgrading to a premium receiver collar would give you more levels of stimulation (8 levels) to choose from PLUS a Lifetime Warranty, how awesome is that? The dog collars are also equipped with anti-linger functionality - if the dogs stay in the "warning zone", it will beep for 20 seconds and then give the dog a stimulation to get him out of the warning zone - saving more battery life. Now, the tri-aerial system technology in the receiver collar ensures that in cases the collar is upside down on your dog’s neck, it will still be able to detect the radio signal from the wire and efficiently give your dog a correction once he gets near the boundary. Also, the replaceable battery in this Pet Barrier Electric Dog Fence for Big Dogs is rated to last up to 2 long years of regular use! We prefer replaceable batteries than the rechargeable ones because if the rechargeable battery runs out, you’d have to pay for a whole new collar - not really cost saving, aye? Each Electric Dog Fence kit comes with 1 standard dog fence collar but you can always upgrade to a premium collar. Got more than one dog? No worries! You can add as many receivers dog fence collars as you need. 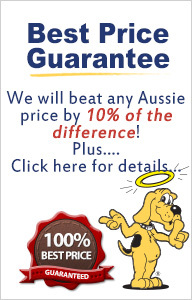 This long-term warranty grants years of safety for your dog and your investment - it covers any fusion damage, specially from lightning strikes, to the Electric Dog Fence transmitter. This saves you money from having to buy a new one if you get a power surge. Just so you know, a new transmitter can cost you more than $250 to replace. The standard Dog Fence Collar ( with 5 levels of correction, waterproof with up to 2 years of battery life) is also covered by the 3-year warranty. On the other hand, the Premium Dog Fence Collar (with more levels of correction) is covered by the Lifetime Warranty. The housing of your dog’s receiver collar is made of Polycarbonate which is a super tuff material… but if your dog will be able to chew it, we will replace it once under the warranty period. Take note that most other collars are made of PVC (polyvinyl chloride) which is waaaay weaker and can’t beat the Polycarbonate design… and no other manufacturer offers a Chew Warranty on their Dog Fence Collars. Do you see that Green Earth Wire in the photo above? The green earth wire - diverts any lightning strike energy away fro the circuit board in the transmitter to the third Earth pin on the power plug - this enables us to offer a lighting protection warranty protecting you from 'fusion damage' or power surgers...it would normally cost over $250 for a new transmitter. For larger properties, we have the FM1200 system which includes an external surge protector - a junction box that also has the green earth wire which helps diverts any excess damaging energy away from the transmitter. Reminding you that besides from this awesome surge protection technology, your kit is also covered by the 3-year warranty from lightning strikes and power surges - saving you the painful amount of more than $250 if you get any fusion damage. Most of the Radio Dog Fences in the market still uses the AM signal which does not perform well - it interacts with other stray signals causing to zap the dog in the wrong areas and for the wrong reasons. Having a Coded Digital FM Frequency is one of the most valuable protection designs that Pet Barrier has… Your dog’s collar receiver won’t interact with other electronics - signals from the TV, cellular phones and radios won’t interfere with the collar, preventing your dog from getting zapped for the wrong reasons. If your neighbour also gets an Electric Dog Fence, their system won’t interfere with your dog’s receiver collar. Heck, you can even let the dog wear the collar inside the house. The boundary wire of Pet Barrier Electric Dog Fence is coated with a high-density polyethylene (HDPe) thermoplastic which protects the wire from harmful UV rays - this makes your boundary very durable and long-lasting and you can simply hang it on the fence. The wire can still be buried under gates, driveways and garden beds and can even go inside a conduit. It is REAL hard to break because of its 1 mm 7 strand copper core wire. PLUS your transmitter has a system that will notify you, by sounding off, in case there is a break in your boundary, we call it the “Wire Break Alarm”. Do Electric Dog Fences Hurt Dogs? The static correction or stimulation the Electric Dog Fence emits to your dog is just like when you suddenly rub your feet on the carpet… or when you touch that cold door knob - it’s not painful but it is annoying. 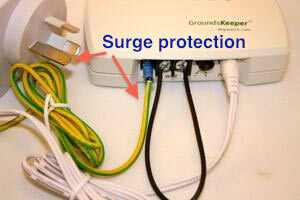 This is enough to deter your dog from going near the boundary wire or from escaping. You can actually test it on yourself using the lowest stimultaion level. Now, remember that your dog will feel the static stimulation lesser than you do because you have thin and oily skin, while your dog has fur, dry and thicker skin. So, this not harmful to your dog's at all. If you still have questions in mind, please do call us at 1300 THE DOG (1300 843 364) so we can answer any of your questions and further help you with anything dog related. 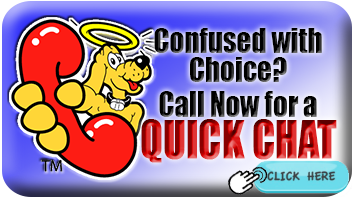 Is your dog always trying to escape and run away from your yard? It's time to think about getting an electric dog fences for a large dog. Here's few points from The Dog Line that will be very helpful in setting up your dog fences. The electric dog fence can be one of the most reliable pet containment systems.The electric dog fence is also acknowledged as one of the most effective solutions for homeowners who want to keep their pets from straying. It is a valuable instrument for dog owners who want to ensure that their pets are safe in their yards. Among all the barriers being sold in the market today, the PetSafe Barrier - Dog Fence variety undeniably provides your dog total protection 24 hours daily.